Larsson took over the coveted task of managing the gargantuan list at wine Mecca Hide late last year, after the departure of the restaurant’s director of wine, Piotr Pietras MS. In the restaurant’s two sections, Above and Ground, there is a mind-boggling 6,500 bin wine list, with Larsson in charge of service and selection at Hide’s more formal Above restaurant, and his fellow head sommelier Dmytro Goncharuk in charge of the less formal Ground restaurant. The mammoth wine list takes in not only the enormous number of bottles stored in the restaurant’s cellars, but also the stock at nearby Hedonism, where anything can be rustled up for high-spending guests. Larsson, from Sweden, began his career in wine after receiving a sommelier-education course for his 18th birthday. A stint at Château Cantenac-Brown in Bordeaux soon followed, where he was able to gain a first-hand insight into the process of winemaking, before setting off for Australia. There he worked for a couple of wineries in Hunter Valley, before taking on a sommelier role at Luke Mangan’s Glass Brasserie restaurant in Sydney. Since then, Larsson has gone on to work at several Michelin-starred restaurants in Stockholm and London, including the two-Michelin-starred Oaxen Krog in Sweden, where he was head sommelier. 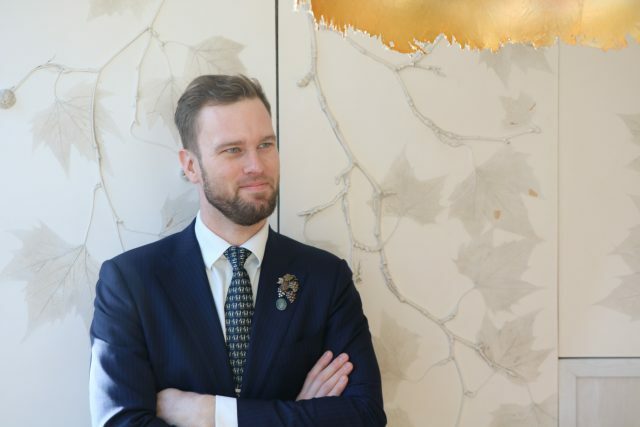 Keen to deepen his knowledge further, he is studying for his Master Sommelier title, and, looking back, has a few words of advice for young sommeliers starting out on their path to vinous employment. His position at Hide certainly lends itself to enjoying many a rare treasure, but it is a bottle of Gentaz-Dervieux 1989 that most recently struck a chord with the ambitious sommelier. Other wines he is keen to sample include a Raymond Trollat from St Joseph, Krug Clos de Mesnil 1979, all the first growths of Bordeaux pre-phylloxera, and a 1905 Salon. Working at Hide, he might just stand a chance of tasting them all.